Tear 'em up with this frighteningly powerful new reel from Penn. 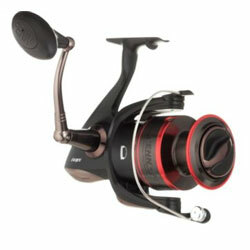 Solid metal body keeps gears aligned even when under load, while the Fierce Spinning Reel's four stainless steel bearings, Techno-Balanced spool, machined-aluminum handle and Soft Touch knob together facilitate smooth, consistent retrieves. Model FRC2000 comes with a sleek, low-profile handle knob. "ive had this reel for only a short time but it has been the best yet. it can handle from big bull reds and snook to snapper and trout. " "the best reel you can buy for under 300 if you want something beter you will need to spend 400 or more in order to get the same quality of this reel and its under 100 great price"
"This seems to be a good product. The disadvantage is the weight. They are heavier than what I am use to, but due to the amount of fishing that I do, I look for durability. "